We eat lots of salads, especially during the work-week for lunches. 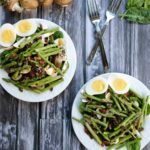 Our honey mustard asparagus bacon salad is great because you can prep the hard-boiled eggs, bacon, and dressing in advance and then just assemble your salad together when you’re ready to eat. You can also make it over the weekend, and store the dressing in a separate container to drizzle over the top when you’re ready for lunch at work. I love that this salad has a variety of greens and protein for a filling salad. It’s hard to pack it away for lunches and not eat it right away when we are cooking the bacon on the stove. The entire house smells like breakfast, enticing me to devour the bacon before it even makes it into my lunch container. That’s what bacon does to me; now you know my kryptonite. It is a good exercise in self control though, and it makes me look forward to lunch at work. This salad also makes a great side dish to go with dinner. We ate it with baked salmon recently, and it was the perfect combination of savory salmon, with salty bacon, hearty veggies and a slightly sweet honey mustard dressing. Try out our honey mustard asparagus bacon salad, and let us know how you like it by leaving a comment below. Also, take a picture and tag it on Instagram @realsimplegood so we can check it out! Cook your bacon bits over medium heat in a medium sized skillet on the stove. The bacon will sizzle and crackle and make your whole house smell like breakfast. Cook it until it is crispy and then place it on a paper towel lined plate to soak up the grease. Hard-boil your egg(s). We follow Betty Crocker for the best hard-boiled eggs. Place your eggs in a medium sized saucepan. Cover with cold water at least 1 inch above the egg(s). Heat to a boil in your saucepan; remove from heat. Cover and let stand for 18 minutes. Immediately cool briefly in cold water to prevent further cooking. Tap egg to crack shell; roll between hands to loosen the shell, then peel. If the shell is hard to peel, hold the egg under cold water while peeling. 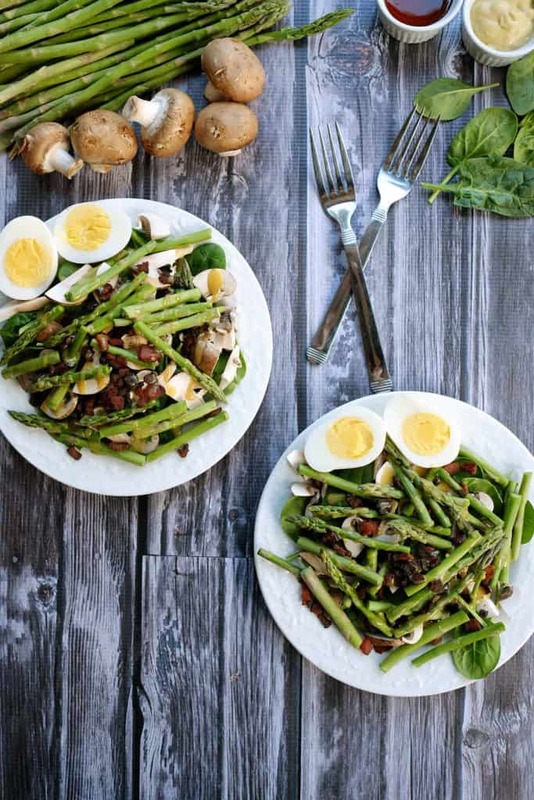 On a salad plate, layer your spinach, mushrooms, asparagus, bacon and hard-boiled egg(s). Drizzle your salad with your honey mustard dressing and eat up! The hard-boiled egg adds protein to your salad so you’ve got a complete meal. You could also add some grilled or baked chicken or salmon on top for more good fats! I know right!? All the good things. Thanks for featuring our recipe this weekend! We’ll be sure to check it out! Oh my goodness this looks so good! 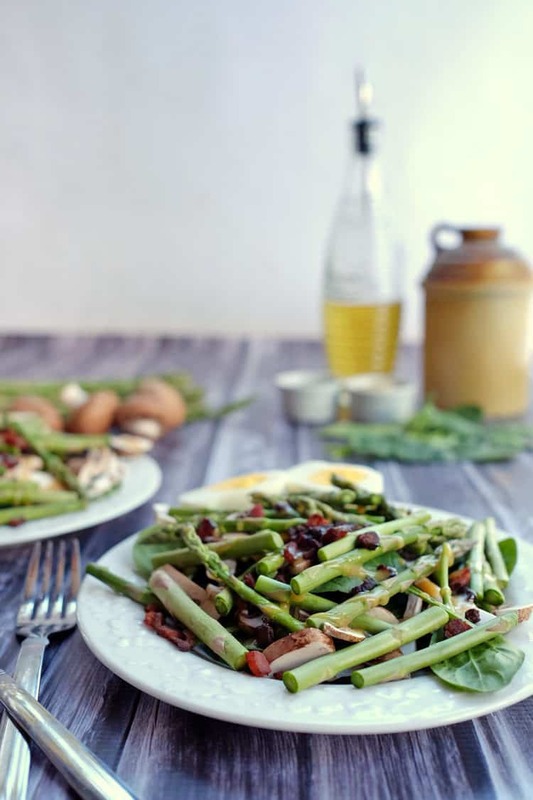 Some of my favorite foods … asparagus + bacon … yum! I’ll be featuring this at Savoring Saturdays tomorrow. Hope you’ll join us again.